Grow with the Bible VeggieTales-style! Join Bob, Larry, and all the rest of the VeggieTales characters as they explore the most amazing book of all time. Filled with fun features, children will learn more about God and how he wants us to live. Veggie Stories feature 8 full-color, best-loved Bible stories as told in the VeggieTales videos, including Dave and the Giant Pickle; Rack, Shack, and Benny; and Esther, the Girl Who Became Queen. Book introductions give important information about each book of the Bible. “Veggie Values” teach lessons from the Bible like God made you special, God loves you very much, don’t be afraid, be kind to others, forgive one another, and many more. “Remember This” highlights key verses of Scripture to remember. A dictionary helps kids better understand key Bible words and concepts. This Bible contains the complete text of the New International Reader's Version (NIrV). Written at a third-grade level and specifically designed to help early readers discover the Bible for themselves, it's the perfect steppingstone to the NIV. This Veggie Tales Bible NIrV is awesome! My kids all love Veggie Tales, even my eight year old so this Bible is loved in our house. I love that there's a few colorful pages as kids always love to see them, especially in their Bible's. 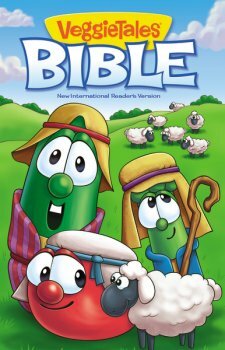 I love the the full color pages because they are some of the best-loved Bible stories as told in the Veggie Tales videos. The book introductions are great give important information about each book of the Bible. I also really love the lessons taught and that my kids are familiar with them due to the Veggie Tales films. The remember this section is a great way to have kids memorize a few verses and the dictionary feature is fantastic as it allows kids to better understand key Bible words and concepts. This Veggie Tales Bible NIrV is written at a third grade level and is an awesome Bible for kids! You can find Veggie Tales Bible NIrV on Amazon, Barnes and Noble and other bookstores.